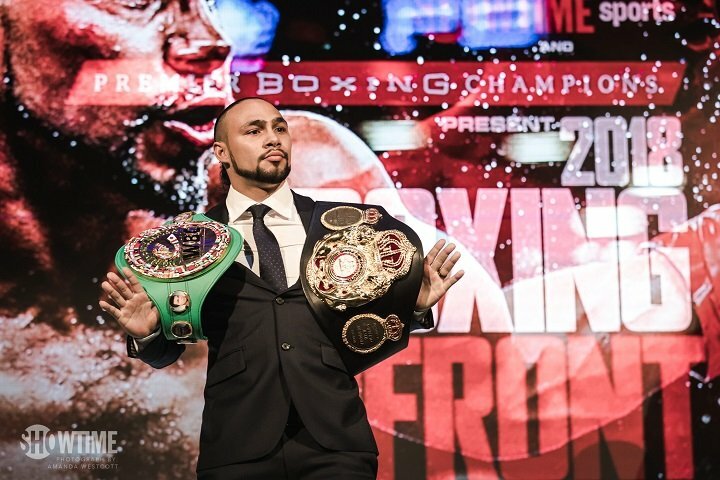 By Jim Dower: Keith ‘One Time’ Thurman had planned on returning on August 4 for his next fight, but it’s now it’s looking like the 29-year-old could be moved to September 8th, according to ESPN. Thurman (28-0, 22 KOs) has been dealing with injury problems for the last year. Thurman had elbow surgery after his win over WBC welterweight champion Danny Garcia on March 4 last year. Thurman was supposed to be coming back on May 19 to resume his career, but he suffered a hand injury in training. The push back from August 4 to September 8 is only one month, but it’s already been 15 months since Thurman last fought, and that’s a long time for a world champion to go between title defenses. If the September 8 date holds true, then Thurman will have been inactive for 18 months. Thurman lost his World Boxing Council welterweight title recently. It’s believed that he was going to be stripped of his title by the WBC. The World Boxing Association hasn’t stripped Thurman yet, but they obviously won’t be overjoyed to hear that he could be out of the ring until September 8. That’s an awfully long time for a world champion to go between title defenses. When Thurman does make his ring return, it’s being talked about that he could fight the likes of Josesito Lopez or Jessie Vargas. Thurman vacating the WBC title got a lot off his shoulders by relieving him of the necessity to fight the winner of the Danny Garcia vs. Shawn Porter fight. Both of those fighters were putting heavy pressure on Thurman to get back in the ring and face them as soon as possible, but he has other plans. He wants to use the entire 2018 as a get back year fighting a weak opponent so that he could ease his way back into competition. Facing good opposition in Thurman’s first fight back could be a disaster for him given how much time he’s been out of the ring. It might be a good idea for the WBA to strip Thurman of his WBA title so that the top contenders can scrap for it. If Thurman’s body isn’t able to handle he rigors of the sport of boxing, it might be best that he become a part time fighter, which you can argue he already is. Thurman has been a “One Time” per year fighter since 2016, and it’s unlikely that pattern will change for him as he gets into his 30s.